A special, additional post, just for my Twitter friend @Hennie07 who wanted to know my views on the Oscar dresses! I had a really quick look through the dresses at lunchtime and this is very much an instinctive reaction. No time for pondering over them for ages. I am sad that I didn’t think better of Livia Firth’s dress, as I know it’s part of her Green Carpet Challenge to wear ethical and environmentally friendly clothing, but it just wasn’t a favourite for me this time around. Anyway, without further ado, here are my favourite dresses of the Academy Awards 2012. I think my absolute favourite is the Tom Ford dress. The chic simplicity of it, coupled with the cape, makes for a stunning change from all the sequins and flounce of many a red-carpet dress. Gwyneth makes it look effortless, although there has no doubt been a lot of backstage preparation! Emma Stone’s Giambattista Valli is gorgeous. Yes, it’s got a giant bow on it, but the cut and colour are perfect for her, and I love the boldness of it. 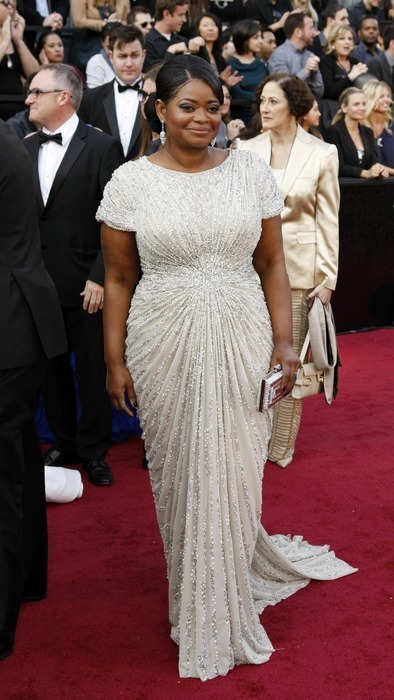 Octavia Spencer’s Tadashi Shoji dress was for me, a brilliant example of dressing well for the red carpet with a curvier figure. I loved her acceptance speech too, so honest and heart-felt. What a night she must have had! I know that Penelope Cruz’s dress is exactly what I denigrated above, as it is pretty flouncy – but hell, it’s a princess frock, isn’t it? If I got a red carpet opportunity, this is probably what I’d wear! Sarah Burton cannot put a finger wrong, and this heavily embroidered McQueen dress on Jessica Chastain is proof of that. It’s stunning. It would have been amazing to see some more British designers showcased – Mary Katrantzou, Jonathan Saunders, Erdem. Although, they might be a little too fashion forward for red carpets perhaps? So, there we are. Do you agree with my choices? One Response to Favourite Oscar Frocks. Thanks so much for a blog just for me! I LOVE Oscar fashion! With regards to the Oscar frocks I always apply the filter of what “would I have chosen” dispensing with any connection to reality so its really “what would I have chosen if I had the body of Cameron Diaz” . So I have to say no to the big red bow as just not my style or the Alexander McQueen – not a big fan of black or gold but it would have made my faves if in a colour (pastel? bright?) and silver! I also loved Gwyneth although it breaks a lot of my rules about what I think of as Oscar appropriate; preferring colour and it has to look like it took months to make – bring on the beads. To my faves list I would also add Cameron Diaz (both ceremony and afterparty) and J LO (ditto) to my list. The rocks also need mention –– again prefer colour rather than diamonds (meh) so let me call out Victoria Beckhams cocktail ring. Again I have to flex my usual preference on accessories as the best piece of the night in my opinion was Gwyneth’s cuff. Obviously @margotandbarbara is far too nice and so I need to say: 80s black velvet NO! Polka Dots NO NO and anything that looks like foil NO NO NO! (The only exception to the foil being Miss Piggy in Zac Posen – can’t fault her ever). Thanks @margotbarbara!